Samsung’s line of Pro tablets went from rumor to reality in just a matter of days as three Galaxy Tab Pro were unveiled at the 2014 International CES on Monday along with Galaxy NotePRO 12.2. Rumors about Samsung’s extra-wide screened tablets, which popped up just one week earlier, proved to be largely accurate. The Samsung Galaxy TabPRO introduces the 12.2-inch tablet display to the market in addition with the Galaxy Tab Pro 10.1 and the Galaxy Tab Pro 8.4. 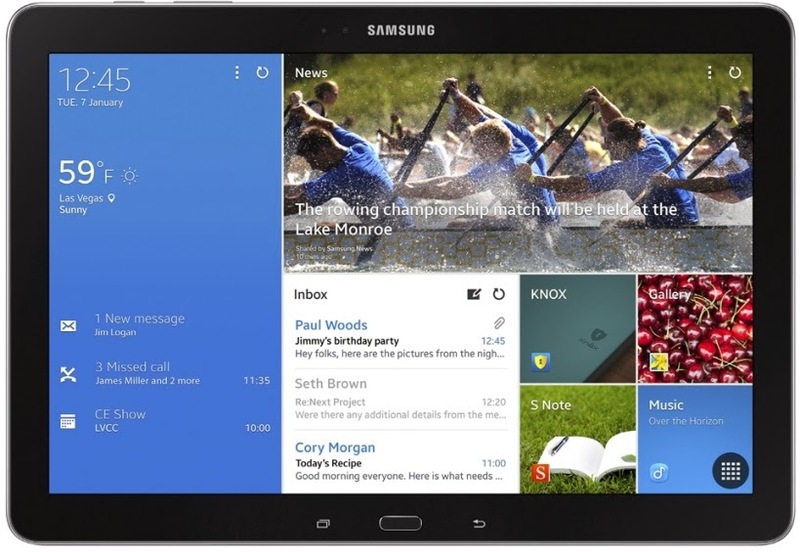 All three tablets run Android 4.4 KitKat and are the first Samsung devices to run the operating system natively. The tablets also feature Samsung TouchWiz and the new, tablet-specific Magazine UX. The flagship 12.2" model is almost identical to the Galaxy NotePRO 12.2 tablet, with the only difference being the lack of the S Pen stylus. The high-end tablet features a beautiful 2,560 x 1,600-pixel display and a look and feel reminiscent of Samsung’s smaller tablets that are currently on the market. In addition to the massive 12.2-inch screen, the Galaxy Tab Pro 12.2 features an 8-core Samsung Exynos processor or a quad-core Snapdragon processor on the 4G LTE model, an 8-megapixel rear camera, a 2-megapixel front-facing camera, 3GB of RAM, either 32GB or 64GB of internal storage, microSDXC support, Bluetooth 4.0, an integrated infrared blaster, a 9,500 mAh battery and Android 4.4 KitKat. The Galaxy Tab Pro also features Multi Window, Hancom Office for Android, Remote PC, Cisco WebEx Meetings and Samsung e-Meeting, in addition to Samsung’s "Ultimate User Content Gift Package." 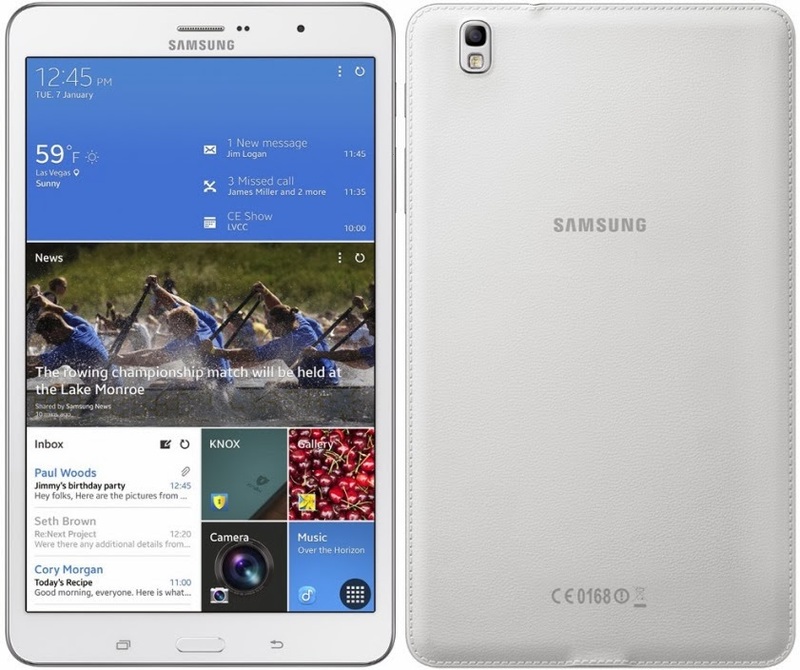 The Samsung Galaxy Tab Pro 10.1 features a 10.1-inch WQXGA (2560 X 1600) Super clear LCD display. The tablet comes in 3G and LTE variants, with the former powered by a 1.9GHz Exynos 5 Octa chipset and the latter powered by a 2.3GHz Snapdragon 800 chipset. Memory includes 2 GB of RAM as well as 16GB and 32GB internal storage options with microSD expansion. The tablet incorporates an 8-megapixel rear camera and 2-megapixel front camera as well as a 8220mAh battery into its 243.1 x 171.4 x 7.3mm frame. Connectivity and networking includes Wi-Fi, 3G, HSPA+ and LTE. The Galaxy Tab Pro 10.1 does not power an S-Pen. While the Galaxy Tab Pro 10.1 features Multi Window, Hancom Office for Android, Remote PC, Cisco WebEx Meetings and Samsung e-Meeting, it doesn't include the "Ultimate User Content Gift Package." The Samsung Galaxy Tab Pro 8.4 features an 8.4-inch WQXGA (2560 X 1600) Super clear LCD display. The tablet comes in 3G and LTE variants with the former powered by a 1.9GHz Exynos 5 Octa chipset and the latter powered by a 2.3GHz Snapdragon 800 chipset. Memory includes 2 GB of RAM as well as 16GB and 32GB internal storage options with microSD expansion. The tablet incorporates an 8-megapixel rear camera and 2-megapixel front camera as well as a 4800mAh battery into its 128.5 x 219 x 7.2mm frame. Connectivity and networking includes Wi-Fi, 3G, HSPA+ and LTE. The Galaxy Tab Pro 8.4 does not power an S-Pen. While the Galaxy Tab Pro 8.4 features Multi Window, Hancom Office for Android, Remote PC, Cisco WebEx Meetings and Samsung e-Meeting, it does not include the "Ultimate User Content Gift Package." The Samsung Galaxy Tab Pro, Galaxy Tab Pro 10.1 and the Galaxy Tab Pro 8.4 are expected to release within the first quarter of 2014, which indicates the tablet should be available to markets by March at the latest. No pricing information is announced yet.